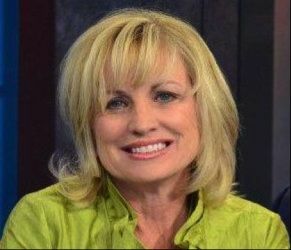 USA GYMNAST, IVY LEAGUE COACH, AUTHOR & BUSINESS WOMAN! The REAL Janet Cantwell-Papale is nowhere near the Hollywood version of Janet Cantwell, played by Elizabeth Banks, in the Disney movie Invincible. Our “bartender & Giants fan”, as portrayed on the silver screen, is actually a successful business woman, mother of 2, former coach and former World Class Gymnast. And oh yeah, she’s married to the subject of the movie Invincible, Vince Papale, for over 2 decades. Janet grew up in Northeast Philadelphia and is the oldest of 9 children. The first six were girls and all rose to at least All American honors in gymnastics. 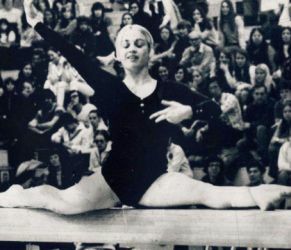 But Janet’s star glittered just a little bit brighter, when at the tender age of 16, she earned a spot on the coveted USA World Gymnastics Team in 1970. She competed in the World Games in Yugoslavia and the Hapoel Games. A severe knee injury ended her gymnastics career but not her spirit. As a student at Penn State, Janet literally re-invented herself and became a diver and eventually broke all of Penn State’s Women’s diving records on the 1 and 3 meter board. She earned her BS Degree in Physical Education while at Penn State. And she taught and coached Gymnastics at State College High School. Janet has traveled all over the world, instructing & coaching, and she developed amateur gymnastics programs for Malaysia, Bermuda, and South Africa, as well as all over the Unites States. Eventually she found at home at the University of Pennsylvania where she became their first Gymnastics Coach. While at Penn, Janet did post-graduate work at the Wharton School of Business. She held her coaching position at Penn from 1976 to 1988, eventually retiring to enter the wide world of Real Estate, just one of her many passions today. 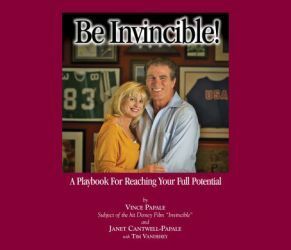 Janet still is a major producer in Real Estate while still managing to find the time to manage several properties, co-author a book with Vince (go to Invincible Books tab), do charity work, fund raising, and direct Vince Papale Promotions . . . not to forget still finding time to be the mother of two children Gabriella & Vincent. Truly a remarkable woman, Janet has a zest for simply helping others be their best. ➢ Real Estate Broker in NJ and PA.
➢ As a member of the Penn State Diving Team, broke all current diving records at that time.